The Front-firing Bass Port in a complex with a 5 "Glass-Aramid Composite Woofer allows you to achieve truly saturated low frequencies. Custom-designed Bi-amplifiers in each monitor are able to achieve a maximum power of 100 W (50 W per channel). Power-saving feature is very annoying (auto shut-off after 30 mins of use). KRK studio speakers have an amazing frequency range that ranges from 45 Hz to 35 kHz, so they will exactly satisfy the requirements of audiophiles and sound directors: all musical instruments will be played in these monitors just as they sound live. The active monitor provides not only the Volume level knob, but also the HF and LF knobs which allow you to achieve optimum sound quality based on your preferences. It is especially useful when placing speakers near a wall or in a corner. Protection against external electromagnetic interference leaves much to be desired (they're not 100% screened against external interference). PreSonis Eris E4.5 have been proven to be universal studio monitors, so they will be the ideal option for equipping a semi-professional home studio, writing and processing music on a computer, playing sounds for synthesizers, and much more. 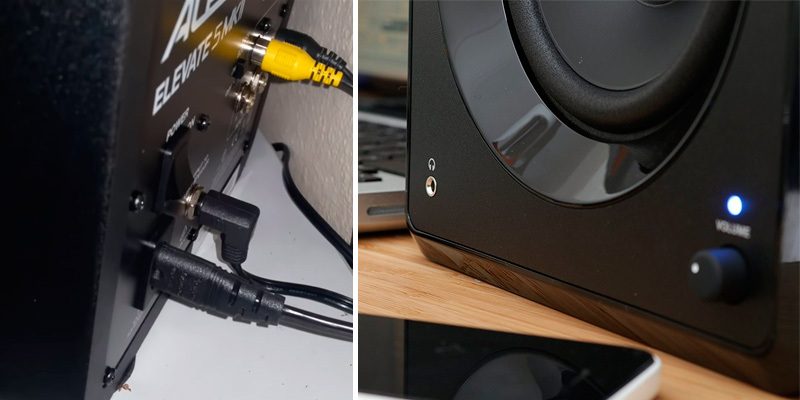 In addition to the popular 2 x RCA and 1 x Mini-jack connectors, 2 Digital connectors (optical and coaxial) are also provided here: thanks to them, you can easily connect the speakers to AV receivers, BD / DVD players, and the sound will be transmitted without distortion or loss. All the knobs are too close together - a bit impractical. 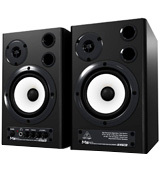 These studio monitors will appeal to people who have a limited budget, but at the same time want to equip a room for a recording studio and achieve the highest quality sound. The power of 40 watts will be enough for medium-sized rooms. Phase inverter holes have special grooves and are arranged in such a way as to significantly expand the low-frequency range. Also, there is no background noise at all even at maximum volume (No feedback noise when volume dial is turned to the max). The frontal insert of glossy plastic requires careful maintenance (shiny plastic is terrible: the surface collects dust like a magnet). The design of Alesis Elevate 5 MKII is thought out to the smallest detail, so their sound will pleasantly surprise even the most demanding music lovers: pronounced low and medium frequencies, as well as pure high frequencies ensure comfortable work with audio of absolutely any genre. The case is made of durable MDF and has Black Vinyl laminate Finish - this not only gives the monitors a stylish look, but also acts as an important advantage in terms of reliability. Foam cushion inside provides insulation for the sound emitters. Compact dimensions, low cost and ease of connection are the main advantages of this active speaker system. And they can be operated as computer speakers, and will give a decent sound, even with a built-in sound card. 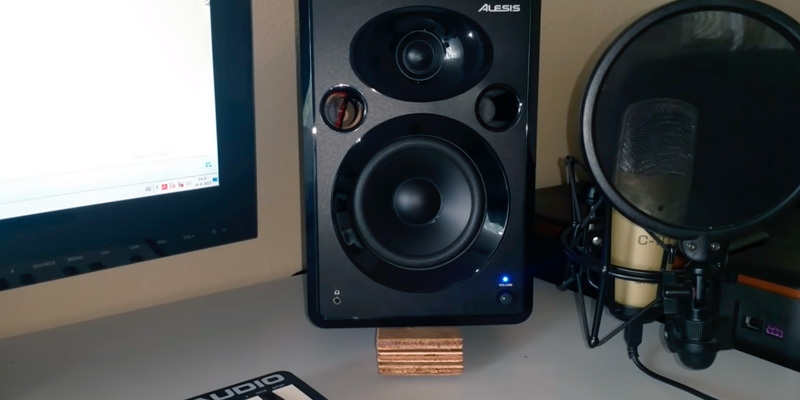 Although studio monitors are generally meant for use in a studio, many audiophiles prefer to use them as home speakers due to their highly accurate sound reproduction. Granted, studio monitors are generally not priced for home use, as they tend to be much more expensive than regular home stereo speakers of the same size, but to audio lovers, there simply is no contest between the two. Studio monitors always have superior sound quality, with audio reproduction that is as faithful as possible to the source. 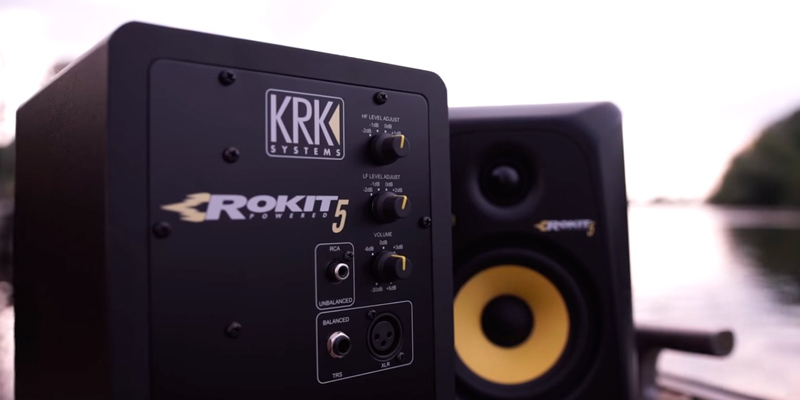 The KRK Rokit 5 Powered Studio Monitor is one such studio monitor pair that has captured the imagination of audio engineers and audiophiles alike. 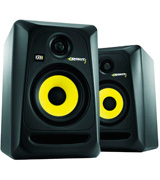 This studio monitor kit features a pair of Generation 3 studio monitors, ideal for a full stereo sound setup, whether it is in a recording studio or in the living room. The monitors are powered by a bi-amped class A/B amplifier that offers a large amount of headroom along with low distortion, leading to a high sound clarity that simply can't be touched by regular home speakers. 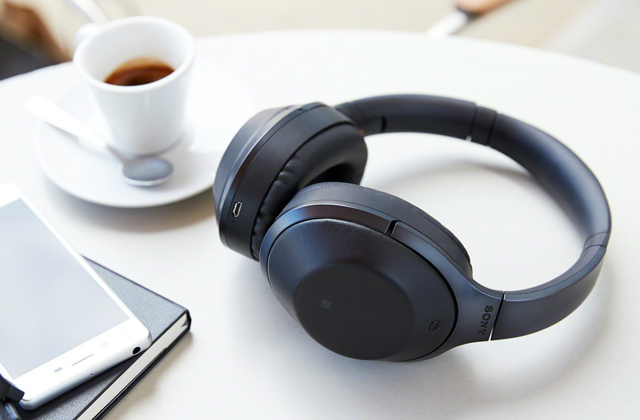 The faithful sound reproduction of this model also leaves many of its competitors in the dust with its soft dome tweeter, which provides a high frequency response of up to 35Khz. The high audio clarity and frequency response is hardly all that this studio monitor pair has to offer. The monitor casing is made of MDF and has a black wrap vinyl finish, giving them a cool, sleek look while also maintaining their durability. The inside of the case features foam cushioning that helps insulate the speakers from outside interference, namely from reverberation that would affect the quality of the speakers. This helps ensure that all sound reproduction through both the bass and tweeter maintain high accuracy. The monitor pair features several controls on the back, including those for volume, HF and LF level adjust, and power. The HF and LF levels let you adjust the sound for both levels to your personal taste, giving you plenty of flexibility in tailoring the exact sound reproduction through the monitor. The power switch is located on the back, which may not be the most convenient spot, but there should rarely be a need to turn the speakers off, as they feature a power saving mode that automatically cuts power consumption to a bare minimum after 30 minutes of inactivity. All of these features combined with the high accuracy and customising abilities give these studio speakers excellent marks all around. The phrase "you get what you pay for" most often rings true, regardless of what it is you are buying. However, it is especially true for any type of audio gear, as any trained ear can definitely tell the difference between sound coming from a cheap pair of speakers from that produced by a professional studio monitor. 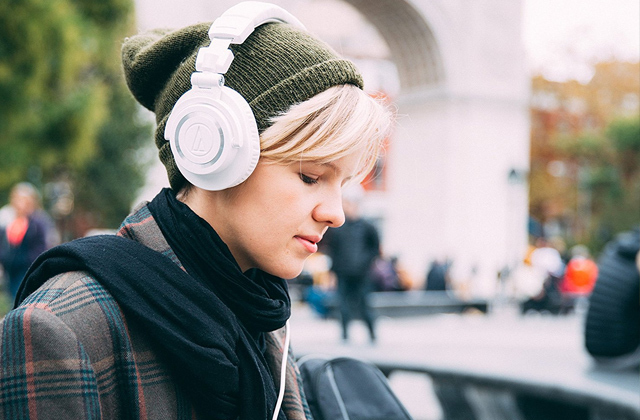 The desire to hear accurate sound reproduction isn't simply limited to audio engineers. Almost anyone who has suffered through sound coming from cheap speakers can attest to how much more pleasing accurate sound reproduction is. The PreSonus Eris E4.5 Studio Monitors bring high-quality and accurate sound reproduction to everyone who can afford a pair of speakers. This budget studio monitor produces crystal clear sound that is extremely faithful to the source, without any distortion or compression added to the mix. 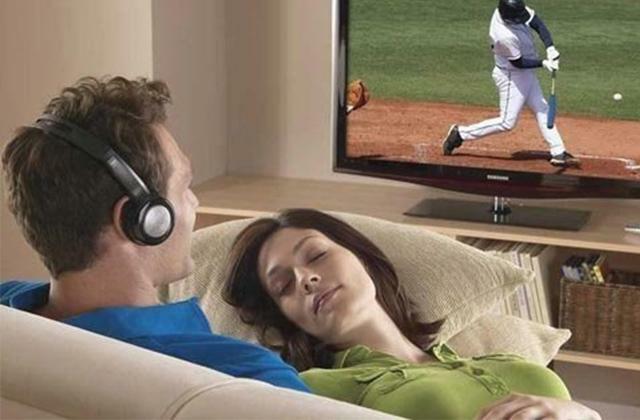 They are also extremely flexible, something often not found with budget monitors, and this flexibility makes them perfect for use in any situation, whether it be for listening to music, home theater enhancement, or even gaming. The small footprint also makes them perfect as desktop speakers, giving any computer user extremely high-quality sound reproduction. The industrial design of these monitors is exceptional, giving the average home user access to studio quality without the high price. The casing is quite strong and durable, and provides protection from RF interference as well as from output-current limiting, over-temperature, and almost any other kind of interference imaginable. The speakers include a 4.5-inch woven composite driver that produces rich, powerful bass while retaining sound accuracy. What is also great about this studio monitor is that it is the only model in its class with acoustic tuning. 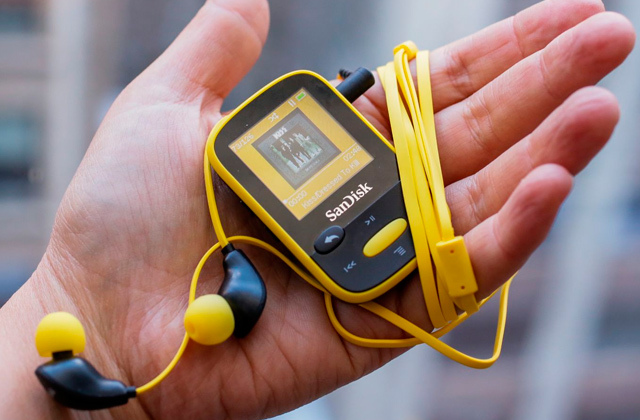 This gives you extremely clear sound quality in any environment, with a crossover frequency of 2.8 kHz. The back of the speakers include the speaker wire connectors, along with the dials for both high and low acoustic tuning, balanced TRS inputs, and unbalanced RCA inputs. 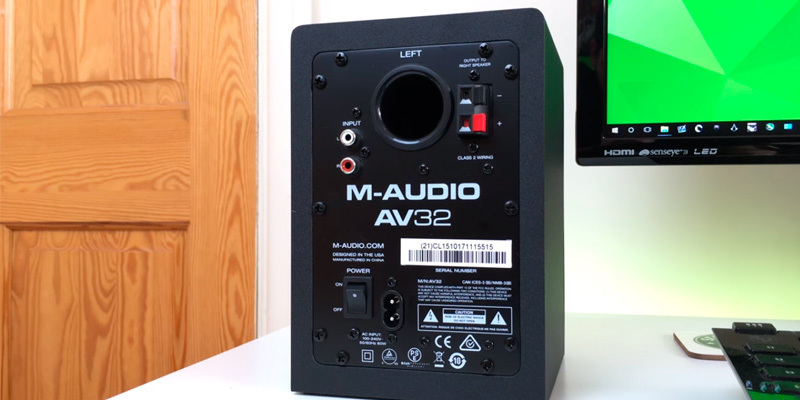 The power switch and volume dial are both located on the front of the left speaker, giving easy access to both, making them perfect and simple to use in either a home or studio environment. What is best about this studio monitor, though, is that the high sound accuracy works great with almost any input source, ranging from televisions, computers, or even from professional studio equipment. 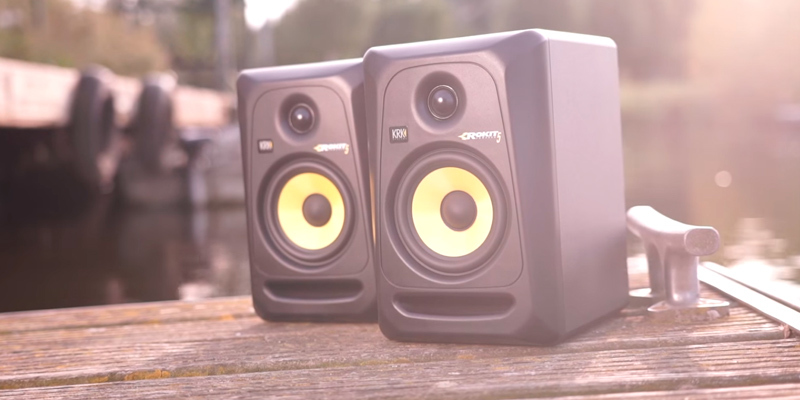 Anyone looking for the ultimate budget studio monitor will certainly fall in love with this pair. 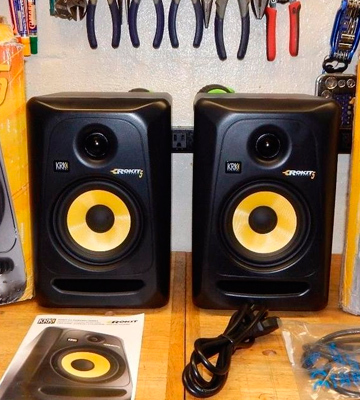 Not all studio monitors are meant for recording artists, or geared specifically towards large recording studios. Although many of them are geared towards music recording studios, there is definitely a need for monitors that can be used for other types of work, such as film and video production, multimedia workstations, and even solo artists who just want a good monitor for their keyboard. Thankfully, there is an ideal studio monitor available for such cases. 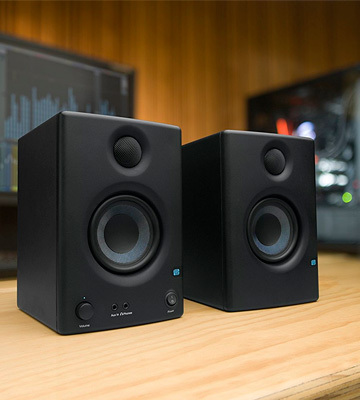 The Behringer MS40 Active Studio Monitor Speakers are an ideal studio monitor pair meant for smaller use case scenarios. 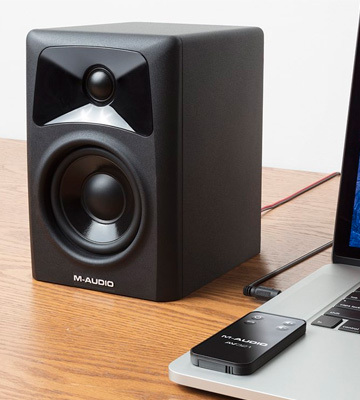 These smaller studio monitor speakers are an ideal size to be used on a desktop, leaving only a small footprint yet giving power, accurate sound reproduction. 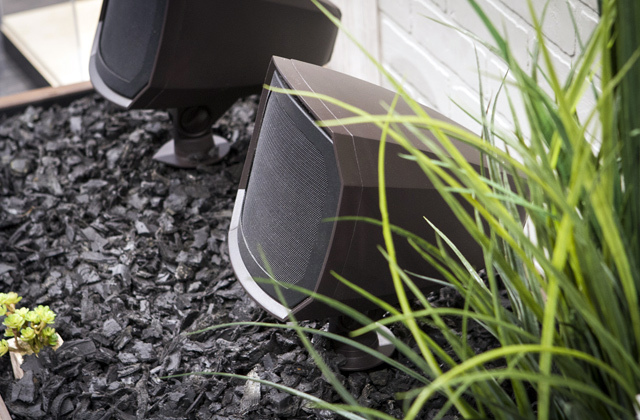 This monitor pair features 2 x 20-Watt built-in amplifiers that are quite powerful, yet provide a large amount of headroom, meaning there is no chance of distorting audio with the volume turned up to max. The woofers and tweeters are quite sufficient for the power provided, and are finely tuned to provide ultra-linear frequency response, giving the whole sound spectrum the ability to be placed back accurately, and without distortion or other interference. The amazing sound clarity provided by this speaker monitor pair is generally enough to persuade even the biggest skeptic, but there's plenty more that this set has to offer. Featured within the internals of the monitor set are ultra-high resolution 24 bit, 192Khz digital/analog converters that provide a huge dynamic range. These converters are specifically tailored for taking the high resolution digital sound output from a professional audio workstation, and convert the signal to analog while retaining the high range and little to no background noise or distortion to the audio reproduction. This studio monitor pair provides plenty of inputs for those who are needing high-quality inputs to go with their high-quality speakers. Located on the back are stereo RCA jacks as well as stereo mini-jack input, along with an output jack that is ideal for connecting headphones. There are also two digital audio inputs, including both optical and coaxial. This allows for virtually any audio system to be connected to these speakers, including both computers and home theater systems, allowing for a great degree of flexibility. Bass, treble, and dual volume controls are also provided on the front of the speaker, giving easy access to them. For any engineer or small-time studio musician needing an excellent set of studio monitor speakers, this model is sure to please anyone. Audio engineers tend to be very picky about which audio equipment they work with in the studio. As fully accurate sound reproduction is a necessity for them, they expect nothing but the best quality sound possible from their equipment. This is especially important for studio monitors, as the speakers tend to be the biggest fault area when it comes to audio inaccuracies. Of course, audio engineers aren't the only ones who worry about accurate sound. Even more casual users will often want studio quality sound in their home. 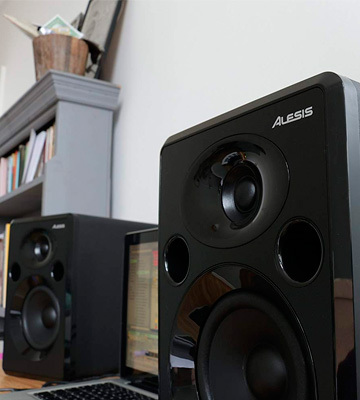 The Alesis Elevate 5 MKII Active Studio Monitor Speakers can bring that high sound reproduction accuracy to home settings. 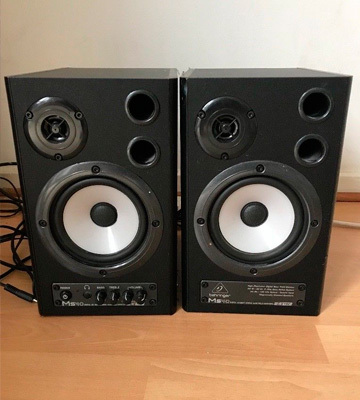 Featuring two high density wooden speaker cabinets, this studio monitor pair has a casing that is sturdy enough to prevent unwanted vibrations and distortions from appearing in the audio playback. Each speaker is provided with a whopping 40 Watts of power, which powers separate high and low frequency drivers with crossover, providing a loud, accurate, and rich audio experience. 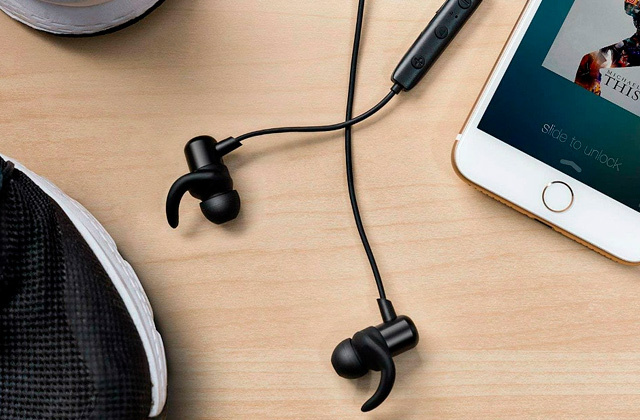 The 5-inch low frequency and 1-inch high frequency drivers ensure that both bass and treble are accurately reproduced down to the smallest detail, providing the full spectrum of audio from any playback source. High sound accuracy is only possible with studio monitors that are made with the best quality materials, and this is exactly what this speaker monitor pair provides. The strong, sturdy wooden cabinets not only filter out and prevent interference with the audio clarity, but they also provide a naturally rich bass playback experience that simply is unmatched by speakers with plastic casings. The internal circuitry along with the silk dome tweeter are also made of only the best quality materials, ensuring strong and accurate sound reproduction over the span of time, without worry of sound quality fading. 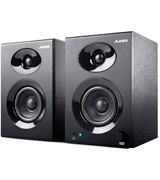 This speaker monitor pair offers plenty of the interfaces that are often expected of such models in its price range. The front left cabinet includes a conveniently located volume knob as well as a 3.5mm stereo headphone jack that lets you easily connect headphones when you need to. The rear of the cabinet offers both RCA and TRS jacks for audio input, giving you plenty of options for connecting both standard and high-end audio sources. A bass boost switch is also included, letting you boost the bass whenever you want a richer and deeper bass experience, and the power switch lets you easily turn the speakers on or off. This high-end speaker pair provides a fantastic audio experience for both the professional and causal audio lover. There are a large number of uses that people can find for studio monitors outside of the recording studio. 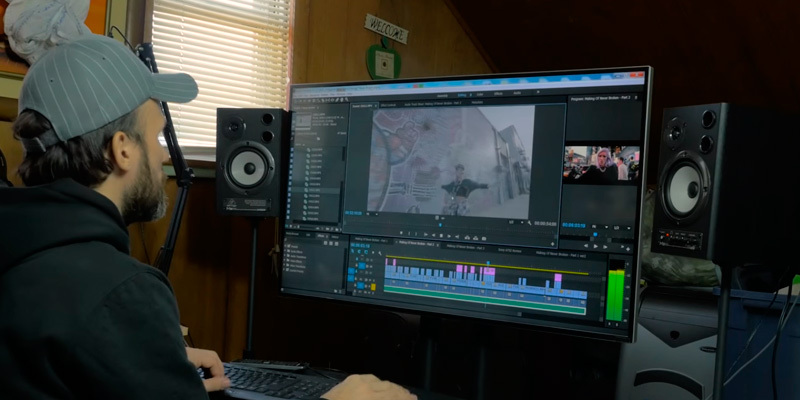 Video editing, music creation, gaming, watching films with high fidelity audio, and many other uses can all benefit from the high-quality and accurate sound reproduction that studio monitors provide. While many models are made specifically only for professional studios, many others are small enough and affordable enough to find uses for the more casual user, while still being high enough quality to lend themselves well to professional uses. 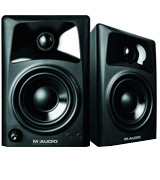 The M-Audio 103294 Active Studio Monitor Speakers are studio monitors that are perfect for almost any use case scenario. They are also quite affordable, meaning that they are not financially out of the reach of most people. Featuring a pair of black vinyl molded cases, this studio monitor pair includes 3-inch polypropylene-coated woofers that produce a rich bass sound along with 1-inch Ferro fluid-cooled silk cone tweeters that hit the high notes clearly and accurately. 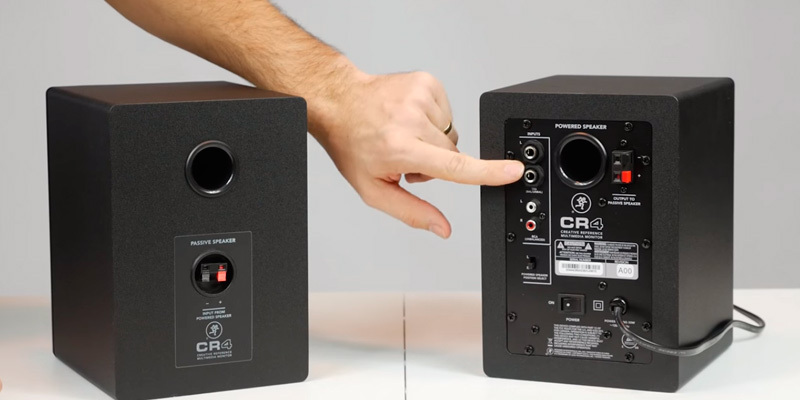 The sound reproduction that these small speakers produce is unbelievable for a pair of their size, ensuring that anyone using them will hear all reproduced sound just as it was recorded live. 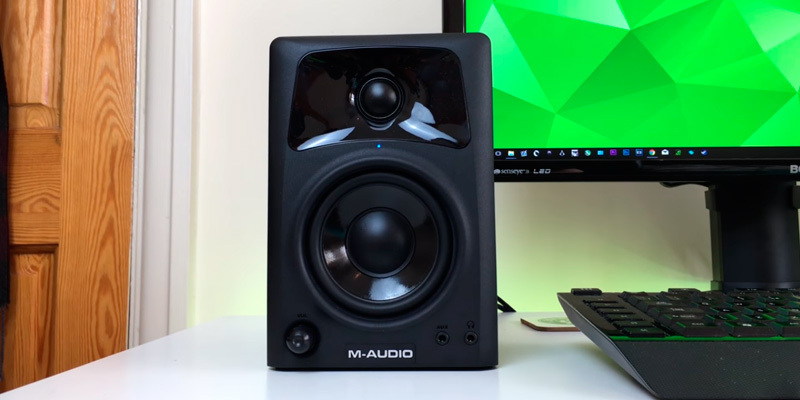 The real beauty of this great studio monitor pair lies not just in its sound quality, but also in the convenience and versatility of use that it offers. The internal amplifier offers 10 Watts per channel, giving a loud, amplified sound while the Image IV tweeter wave guides keep the sound reproduction clear and accurate. The casing itself is both sturdy and pleasant to look at, giving a futuristic, high-tech look that is certain to look great wherever the speakers are placed. 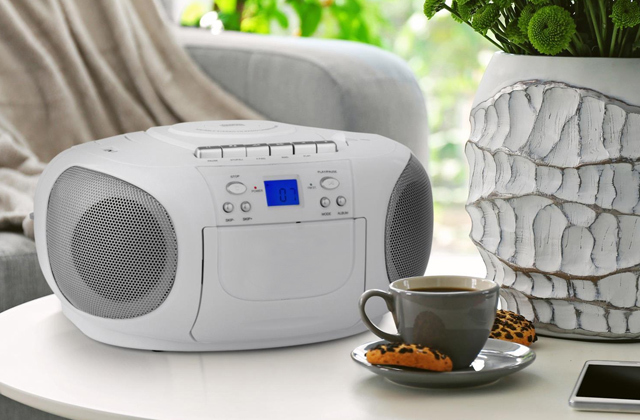 The front of the left speaker includes a knob for volume as well as a 1/8 inch stereo auxiliary input that allows you to easily connect a laptop, smartphone, MP3 player, or any other mobile device for instant audio playback. 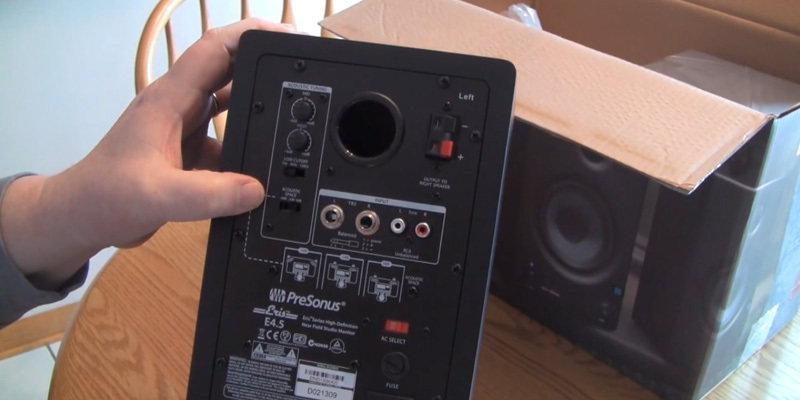 The rear of the same speaker also includes conveniently located RCA jacks that let you connect the speakers to almost any audio playback device, including your home theater system. Also on the back are connectors for the right speaker, as well as the power connector and power switch. 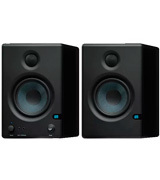 Virtually any audio playback device that is connected to this studio monitor pair will greatly benefit from the rich, warm, and high sound reproduction accuracy offered by this great pair, which is certain to please anyone who purchases it. Speakers are a part of most people's lives. Whether we're at home, driving in a car, sitting at work, or even out and about, there are speakers everywhere, meant to reproduce audio in one form or another. Most speakers are suitable enough for most people, but when it comes to professional audio engineers and studio recording artists, a standard speaker just isn't enough. Most standard speakers do a good enough job of reproducing audio, but many consumer speakers have some limitations when it comes to the audio clarity. Often, they will have a limited frequency range, which means that certain sounds remain inaudible. Speakers may also not have frequency equalization balanced properly, which may distort the bass or treble that is reproduced, causing inaccurate sound reproduction. The fix for this, of course, is to use a studio monitor. Studio monitors are special speakers that are engineered to reproduce audio at its most accurate level. 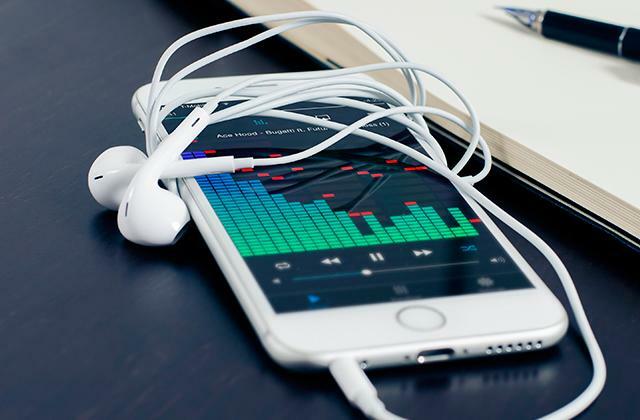 This means that audio reproduction is exactly as it is heard from the source, whether it be from pre-recorded material, or live audio coming from a studio. This is especially important for those working in an audio studio, as audio engineers need accurately reproduced audio in order to work on an audio production. 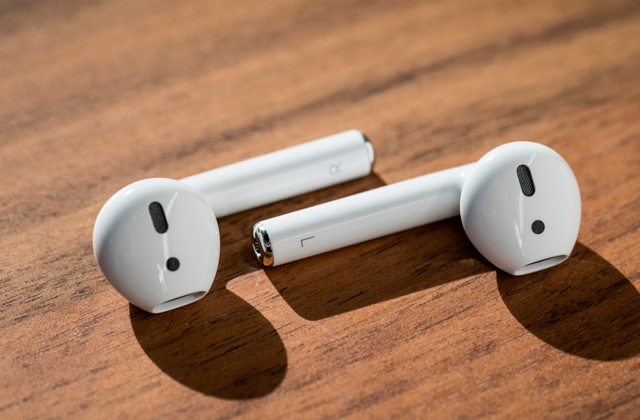 However, it can be equally important for a wide range of other purposes as well, even for just home audiophiles who want an accurate listening experience. 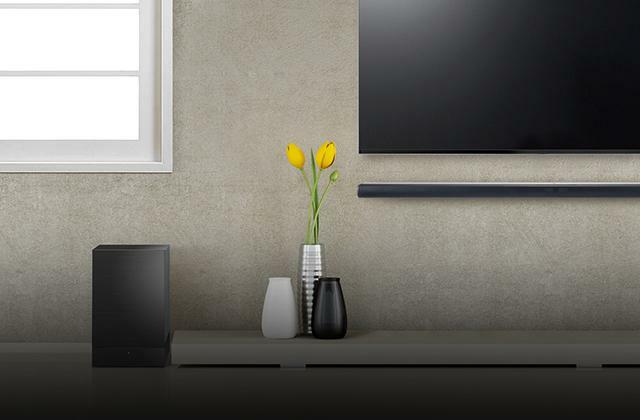 If you are just looking for speakers for your home entertainment needs and don't need a dedicated studio monitor, then take a look at our reviews of the best soundbars. Studio monitors are all made for the specific purpose of providing the best and most accurate representation of audio from its source. However, not all studio monitors will work the same way, or provide as accurate of a sound as other models. They have a tendency to vary by brand, and even by model, with some being a bit better at their jobs than others. Even more, some may contain features that other models lack. Knowing which features and capabilities you need as well as which ones are offered will help a great deal in choosing the best studio monitor for your needs. One of the most important capabilities of a studio monitor is its frequency range (measured in Hz - Khz), which shows the level of frequencies that can be reproduced by the monitor. All audio that is produced is done at a specific frequency, which determines the pitch of the audio. Most studio monitors are made to work with a wide range of frequency, but even so, there are always limitations on the frequency range. Make sure that whichever model that you want to buy has the best frequency range possible. Another important consideration about a studio monitor is in the controls offered on it. Many studio monitors may not have any controls, instead relying entirely on the audio source, but most will at least have volume controls, although many other types of controls are also typical, including HF and LF controls, Room Switch, Input Sensitivity, Boundary EQ, and others. If you require specific controls for your studio monitor, then make sure that the model that you get has the ones that you need. The interfaces offered on a studio monitor can be just as important as anything else, as a studio monitor is no good if you can't connect anything to it. Most studio monitors will come with the standard XLR connectors, but some may include others, such as TRS or even RCA jacks. XLR connectors tend to be the most common by far, as they are the ones most often used in studio equipment, but having the other types of connectors is always a bonus, and may even be necessary for some people. Finally, some other extra features may be of interest to those who are needing a studio monitor. The extra features provided by different studio monitors tend to vary greatly, with many being features of the case or speaker housing that ensure completely accurate audio reproduction. Some others may include specific controls for equalizers and other audio optimizations. If there are specific features that you want in your next studio monitor, then make sure you choose a model that has those features included. Throughout both the reviews listed above and in the product pages of the studio monitors reviewed, there are a lot of specific terms related to audio technology that the average person may not be familiar with. Not knowing what most of these terms mean will probably hamper your understanding of what benefits and drawbacks that each studio monitor has, so it is a good idea to become more familiar with audio terminology before comparing the different models. Below are many of the most frequently used terms, along with explanations for what they mean, or what exactly they measure, depending on their use. Amplifier - An electronic device that amplifies (strengthens) an electrical signal. 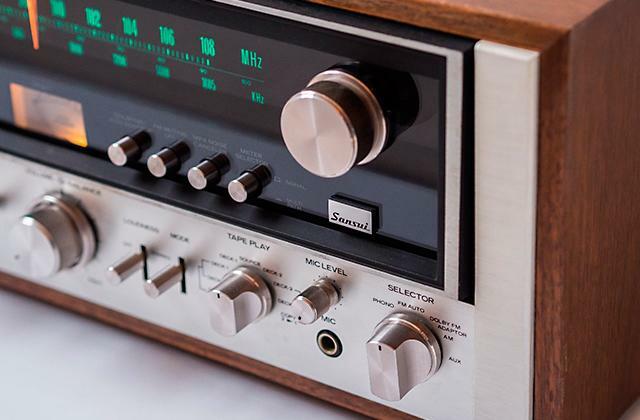 Amplifiers are important components in speakers, as they ensure that the electrical current carrying the audio signal has enough strength to create clear, loud audio reproduction. Balanced Audio - This term refers to audio signals that use special inverted voltages to prevent distortion or other unwanted noise from creeping into the audio signal. When audio ports are labeled as "balanced", this means that the circuitry for the ports contains this protection. Decibel (dB) - This is a unit of measurement of an audio signal, often used to indicate volume. The higher the dB measurement, the stronger (or louder) the audio signal. Equalization - The process of adjusting various frequencies in an audio signal in order to achieve the desired sound. Many studio monitors, as well as various audio equipment, include controls for adjusting the equalization of audio. Frequency Response - Most audio devices carry a specific sensitivity to audio frequencies, meaning that even weak audio signals can be picked up and reproduced. The frequency response of a studio monitor indicates how high or low audio signals can be accurately reproduced. The larger the frequency response range of a monitor, the wider the range of audio it can reproduce. Hertz / Kilohertz (Hz / kHz) - This is a measurement of a frequency measuring cycles per second, often used to indicate the frequency of an audio signal. Kilohertz is 1000 hertz. 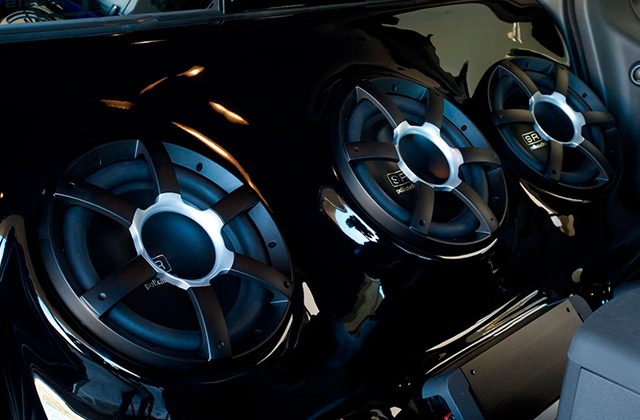 Headroom - Strong audio signals can sometimes run the risk of damaging speakers when played at full strength. This term refers to the amount of "safety space" provided in speaker equipment that prevents this from happening, ensuring that the strongest audio signal provided by the device is always lower than the maximum strength that it can handle. Mixer - An audio device that receives two or more separate audio signals and combines them into one audio output. RCA - This term refers to connectors that were initially created by the company of the same name. These connectors are quite common on most home audio and video equipment, and consist of two separate connectors on each end, one for each stereo channel. Reverberation - Often shortened to "Reverb", this indicates the propensity of sound waves to bounce off of different objects. Heavy reverberation can often cause distortion in audio reproduction, due to the analog nature of speakers and how they reproduce sound. Stereo - Most audio that is created nowadays is done using two separate audio signals, meant for left and right speakers. Transducer - This is a component in a device that converts a type of energy in another form. 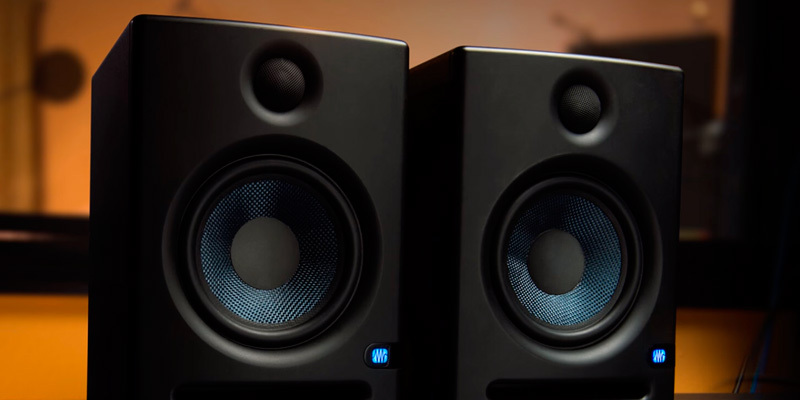 In studio monitors, it is the component that converts the electrical audio signal into a percussive energy that is used by the speakers to reproduce audio. XLR - This is a type of industry standard connector that usually includes 3 pins, and is often used to connect audio equipment together. It is a lockable cable that is not easily detached from a jack.